It’s the 10th Anniversary of Farm-to-School Week in Virginia! 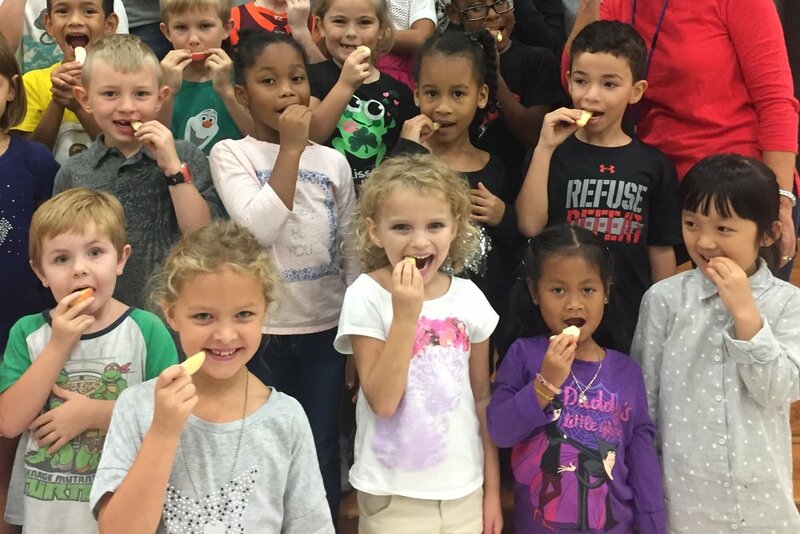 As part of the Farm to School Week celebration, school children and families around the Commonwealth are invited to “crunch” into a Virginia Grown apple for “The Crunch Heard ’Round the Commonwealth” at 10 a.m. on Tuesday, Oct. 4. Photo courtesy of VDACS. This week, Oct. 2-6, Virginia celebrates Farm to School Week. The 10th anniversary for an annual program coordinated by the Virginia Department of Agriculture and Consumer Services (VDACS) and the Virginia Department of Education (VDOE) with support from many other statewide partners. Now in its 10th year, the program raises awareness of fresh, Virginia grown products available throughout the year. On a typical day, Virginia’s K-12 public schools serve 313,796 breakfasts, 643,432 lunches and 10,782 after-school snacks, according to the VDOE. In fact, in a recent USDA survey of more than 1,300 Virginia schools, approximately half of their meals and snacks, on average, contain products from local produce, meat and dairy farmers. The Virginia Farm-to-School program connects schools directly with Virginia farmers and local fresh food distributors, giving school children greater access to fresh, local food and increased market opportunities for Virginia farmers.